2016 was the year of performance – here's how you can make your sites faster and leaner. This year, as an industry we took big steps in dialing up the conversations about web page performance. A few focused changes can completely alter a site's performance, and every little bit – or rather, byte – is worth it. Performance matters because we're designing and developing for the user; so if it doesn't work for them, it doesn't work at all. Site performance can be affected by a variety of elements, including network speeds, image sizes, non-minified resources, font file size, and the number of requests. Paravel developer Dave Rupert wrote not one, but two blog posts about how he tackled a lot of these issues on his own responsive site. Font hosting can also cause page bloat. One way to reduce this is by only including the type weights that have been used in your project. Keep to a few weights and consider other ways to push contrast and hierarchy. Below, check out three tools that help you dissect your site and learn more about how long it takes to load. 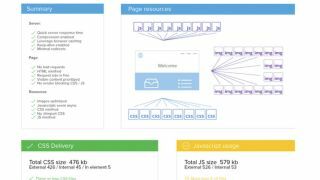 Varvy's Page Speed Optimization tool is well-organised, detailed and includes resources about the whys of performance to make it identifiable. Pingdom's free option includes details on the waterfall load time of each element or request. WebPageSpeed is an extremely popular tool. It includes all those options listed so far, plus downloadable videos of how long a site and its elements took to download. This article was originally published in issue 286 of net magazine, buy it here.